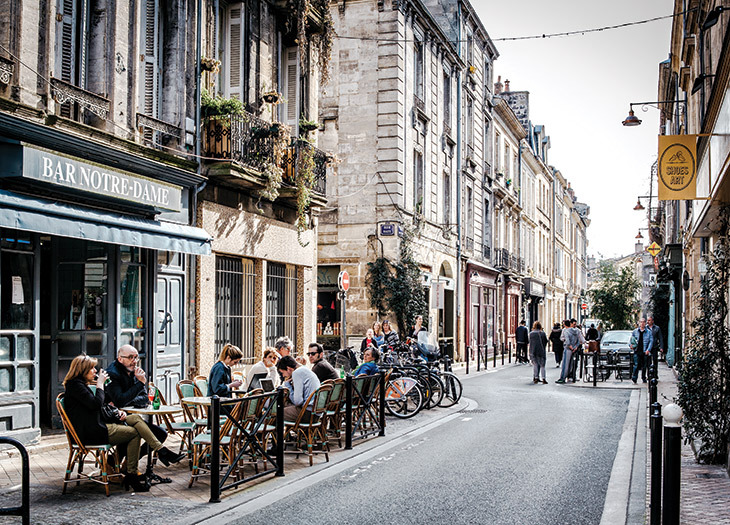 Rue Notre-Dame's cafe scene in Bordeaux. Where to stay, eat, drink, and shop in the French city of Bordeaux. Le Verre ô Vin wine bar. Bordeaux fetes its wine pedigree with the June 2016 opening of the nearly 44,000-square-foot Cité du Vin museum in the up-and-coming Bacalan neighborhood – just in time for matches of the UEFA Euro 2016 soccer tournament at the recently inaugurated Matmut Atlantique stadium. A modern tram system zigzags past spruced-up UNESCO World Heritage buildings, leafy squares, and the imposing Saint-André cathedral. Lollygagging into the wee hours on a terrace in the historic Saint Pierre district is a favorite Bordeaux pastime, as is rolling and strolling along the Garonne River under summer’s ubiquitous sunshine. An enviable dining scene has ramped up even more with the recent arrival of chefs such as Gordon Ramsay at Le Pressoir d’Argent (2-5 place de la Comédie), featuring regional specialties such as Aquitaine beef, Atlantic sea- food, and foie gras. Chef Philippe Etchebest (star of the French version of Ramsay’s Kitchen Nightmares) greets guests table by table at his regal bistro Le Quatrième Mur (2 place de la Comédie), which opened in September inside the gorgeous Grand Théâtre. The country’s most decorated cuisinier, Joël Robuchon, serves prix xe menus of artistic and contemporary French fare at his eponymous chandelier-lit restaurant, which just garnered its second Michelin star. (10 rue Labottière). 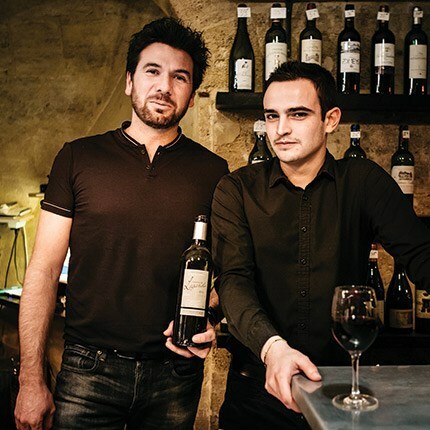 Hole-in-the-wall gets a trendy twist at Le Verre ô Vin (43 rue Borie). The vaulted limestone wine bar in the Chartrons neighborhood serves southwestern French bites and a global array of wines by the glass. The leather banquettes of Le Dix (10 place de la Bourse) are just right for afternoon tea or a signature cocktail of Champagne, basil, strawberry puree, and gin. Saturday morning means a glass of crisp white wine with oysters at one of the numerous seafood stalls inside Marché des Capucins (place des Capucins), Bordeaux’s historic marketplace and larder of Basque food specialties. Designer names such as Hermès (2 place Gambetta) and Louis Vuitton (60 cours de l’Intendance) shine in Bordeaux’s “Golden Triangle” district, but for treasures with character, browse the antiques shops along rue Notre Dame in Chartrons. The ground floor boutique of the new Cité du Vin (150 quai de Bacalan) sells more than 14,000 bottles of wine from some 80 countries, including unexpected producers such as Ethiopia and Tahiti. of creamy and odorous French favorites and selections from roughly 30 countries line shelves. The traditional InterContinental Bordeaux - Le Grand Hôtel sets the luxury standard with 130 rooms, a roof bar with direct views over the eighteenth-century opera house, Gordon Ramsay’s one-Michelin-starred Le Pressoir d’Argent, and Les Bains de Léa Nuxe Spa, where travelers relax amid a column- encircled swimming pool, rooftop Jacuzzi, and hammam. A half-hour outside the city, Les Sources de Caudalie not only serves great wine, but its guests feel better for it at the spa, which is known for its grape-infused product line. Forty rooms and 21 suites reveal wine-country decor and views of the Château Smith Haut La tte vines. Make sure to reserve a table at its two-Michelin-starred restaurant, La Grand’Vigne. Originally appeared in the May 2016 issue of Virtuoso Life. Connect with an advisor to plan your trip to Bordeaux.